2 of 6 Push mango chutney through a sieve with spoon or rubber spatula over a bowl; reserve liquid and solids separately. 3 of 6 Make 3/4-inch-deep slits in top and bottom of turkey breast. Stuff slits with bits of mango solids (photo 2). 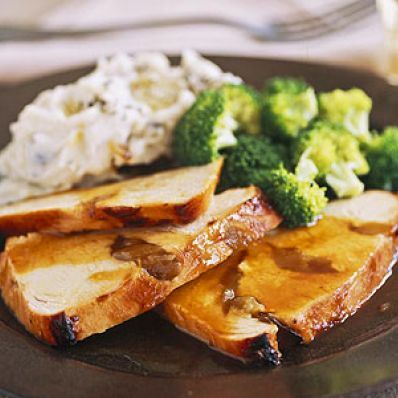 Brush top of turkey breast with 1 tablespoon sesame oil. Place turkey breast, breast side up, in a large roasting pan. 4 of 6 Roast in 425 degree F oven for 20 minutes. 5 of 6 While turkey is roasting, in a small bowl, stir together the liquid from the chutney, the teriyaki sauce and the remaining 1 tablespoon sesame oil. Remove 1/4 cup of the mixture for basting. Reserve the remaining mixture to serve with the turkey. 6 of 6 Reduce oven temperature to 375 degrees F. Brush turkey with 2 tablespoons of basting mixture. Roast in 375 degree F oven for 10 minutes. Brush turkey with remaining basting mixture. Bake 10 minutes more or until instant-read thermometer registers 170 degrees F. Let the turkey rest for 10 minutes. Then slice the turkey and serve with reserved teriyaki sauce. Makes 6 servings. Per Serving: 6 g Fat, total, 19 g carb., 1 g sat. fat, 109 mg chol., 298 kcal cal., 684 mg sodium, 1 g fiber, 41 g pro.